After a string of suc­cessful meets, the Hillsdale College Chargers seemed to take a step back at last weekend’s Wide Track Classic. As the events con­cluded in the Biermann Ath­letic Center, the Chargers found them­selves in ninth place with 51.5 team points. Further up the standings, con­ference rival Tiffin Uni­versity fin­ished third with 84 points, and national pow­er­house Grand Valley State Uni­versity fin­ished fourth with 81 points. Just two weeks after breaking a 27-year-old school record, freshman thrower Nikita Maines proved her per­for­mance wasn’t a fluke. Her throw of 14.09 meters at the Wide Track Classic broke her pre­vious record of 14.05 meters, and shows her con­tinued improvement in the event. For Maines, however, this record is just the beginning. 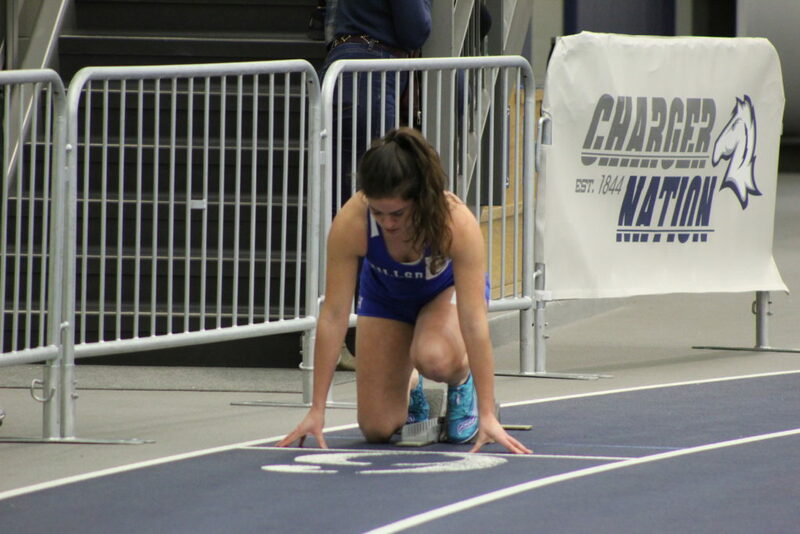 On the track, with sophomore sprinters Zalonya Eby and Kajsa Johansson out due to injury, Hillsdale struggled to find success in the sprint events. Faced with a deep field of nationally com­pet­itive sprinters, the Chargers failed to place in the top ten. One of the bright spots for Hillsdale was the per­for­mance of the relay teams. In the dis­tance medley relay, senior Ally Eads ran the fastest time in the anchor mile leg to take first place. Joining Eads were sopho­mores Maryssa Depies, Calli Townsend, and Abbie Porter. These four fin­ished the relay in 12 minutes and 9.56 seconds, a time fast enough to achieve a Division II pro­vi­sional mark in the event, placing the team in position to qualify for the national meet. The Chargers also put forward a strong showing in the 4x400 meter relay. Townsend and Porter teamed up with freshmen Melanie Boehm and Alanna O’Leary to take second in four minutes flat. In the mile, Eads fin­ished in third with a time of 5:03.63, just two seconds off the pro­vi­sional mark. As the Chargers look forward to the rest of the indoor season, just two meets remain before the G-MAC Indoor Cham­pi­onships. Hillsdale will travel to Allendale, Michigan, tomorrow for the GVSU Big Meet in hopes of getting back on track before returning home the fol­lowing weekend for the Hillsdale Tune Up. Events begin at 10 a.m.